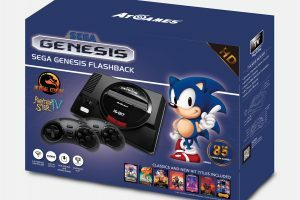 AtGames has released the 2016 version of their Sega Genesis Classic Game Console, which is just now starting to be available from major US retailers. 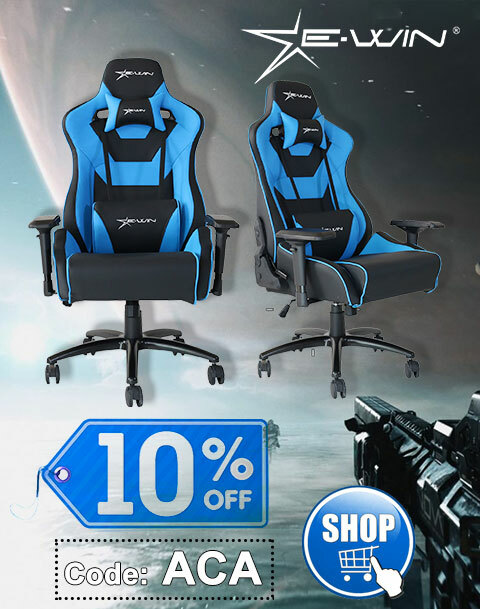 While list price is $69.99, typical retail price is often quite a bit less. The Classic Game Console is part of the new AtGames Flashback Zone, which encompasses an increasing number of retro-themed products and a new social media presence on both Twitter and Facebook. The AtGames Flashback Zone is expected to be the AtGames retro gaming portal going forward and should hopefully see regular expansion. 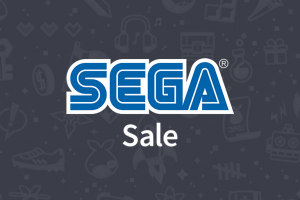 Other products for this year include: Atari Flashback 7 (available now), Atari Flashback Portable (available November), Sega Genesis Ultimate Portable Game Player (available now), and Atari Flashback Classics Volume 1 and Volume 2 for Sony’s PlayStation 4 and Microsoft’s Xbox One (both available soon). I should eventually have reviews posted for all of those products. 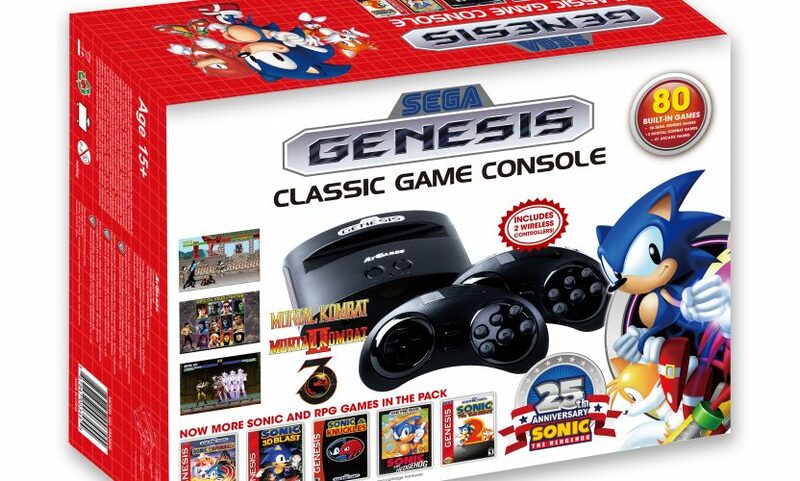 This year’s edition of the Classic Game Console sports the 25th Anniversary Sonic the Hedgehog logo on the box and an addition of one extra Sonic-centric game, Sonic 3D Blast. Of course, that’s not the only change for this year’s edition, which I detail next. You can see the game list for this version here, and the 2015 version here. There are 39 original Genesis games, and 41 newer games (and swing of -1 and +1, respectively, over 2015) that are coded to be Genesis-like, but take advantage of the extra capabilities of the AtGames hardware. Lost from the 2015 version are: Ecco, Ecco Jr, Streets of Rage, Streets of Rage 2, Streets of Rage 3, and Virtua Fighter 2. New additions for 2016 are: Eternal Champions, Phantasy Star II, Phantasy Star III, Sonic 3D Blast, and Sword of Vermillion. Virtua Fighter 2 was replaced with one of the “other” non-Sega games. It’s with the additions of the Phantasy Star II, Phantasy Star III, and Sword of Vermillion role-playing games that the biggest change reveals itself: save game support. Otherwise, the hardware itself is virtually identical. The console itself is quite small and light, measuring approximately 5.5 x 4 x 5 inches (13.8 x 10 x 12.7 cm). At the top of the console is a cartridge slot and a power indicator LED, which is flanked by ON/OFF and MENU buttons, the latter of which can be pressed to reset the console without powering it off. On the front of the console is the infrared sensor, which is flanked by two ports for plugging in wired controllers. The rear of the console has separate AUDIO (white) and VIDEO (yellow) composite connections, which works with the included, but relatively short, composite cables, or, you can of course use your own. Finally, there’s a 9V DC jack for use with the included power supply. Both controllers, which mimic, but do not directly replicate, the proven design of the original Sega Six Button Control Pad, are functionally the same, just with the addition of a MENU button above START, and contain a switch to designate one or the other as player one (P1) or two (P2). As with the Atari Flashback series, these controllers use like-it-or-hate-it infrared wireless technology, which requires general line of sight with the sensor on the front of the console to work properly. Each controller requires three AAA batteries, which are not included. Of course, you can also plug in just about any original wired Sega Genesis controller directly to the console, including many of the third party replacements. 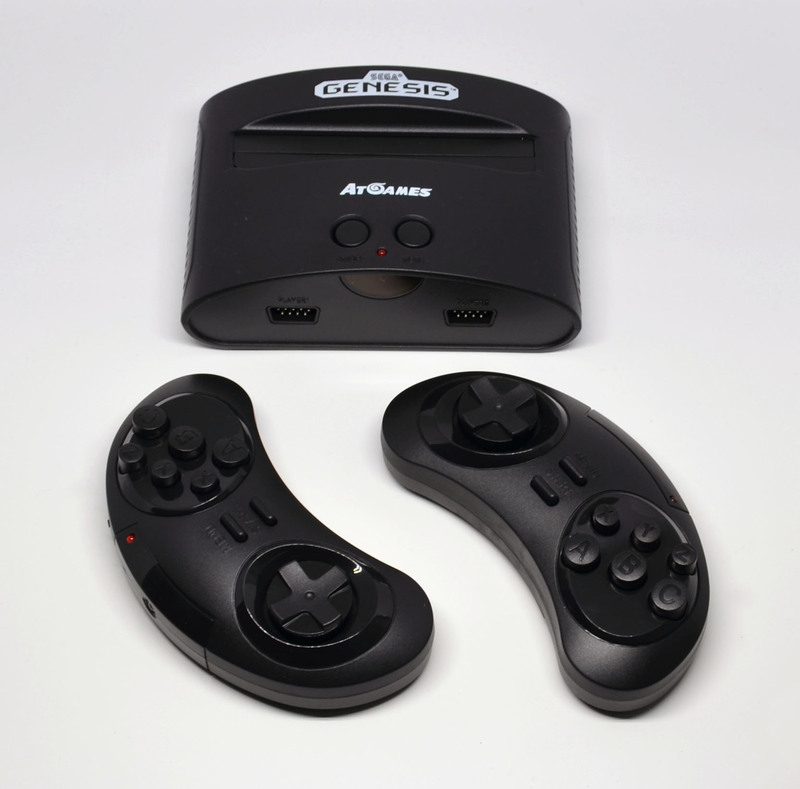 AtGames themselves makes wired versions of their infrared controllers, which are available from the aforementioned AtGames Flashback Zone, and also work on original consoles. The controller is almost the same size as the console. The menu system is straightforward. Move up and down or left and right to move between the games and pages of games. Once you select a game by pressing START, it starts up the same as it does on a standard Sega Genesis. I had no issue with a random sampling of cartridges I tried. Just plug the cartridge in with the console off, turn the console on, and the game starts up immediately, bypassing the internal menu system. Pressing the MENU button resets the console, restarting the cartridge. I also tested with the two flash carts I have, EverDrive MD and Mega Driver Flash Cartridge (a clone version of the EverDrive MD). I had no issues running games with the EverDrive MD, with most standard games running just fine, but the Mega Driver Flash Cartridge didn’t work (note that AtGames sells their own SD card cartridge solution to run ROMs on the AtGames Flashback Zone, but I didn’t have one on hand for testing). Flashcart or original cartridge, it’s important to keep in mind that not every game will work. You’re probably looking at greater than 95% compatibility here, something akin to the level of the Sega Genesis 3, which was released by Majesco with Sega’s blessing in 1998, but given the large size of the Genesis library (700+ titles), that still leaves a good number of incompatible titles, including some high profile releases, like Virtua Racing, which has special hardware on its cartridge, or certain modern homebrews, like Star Odyssey (it should be noted that neither of those games work on my Sega Nomad handheld either!). As expected, original add-ons like the Sega CD, 32X, or Power Base Converter don’t work either. You can judge for yourself from the included videos, but, for the most part, there are some minor color and sound variations versus what you’d get from a real Sega Genesis console. Worst is probably the sound simulation, as some notes sound almost “sour.” With that said, everything is still perfectly playable, and, unless you’re looking for specific differences, you likely won’t be too bothered by any of the drop-off in relative audio-video quality. 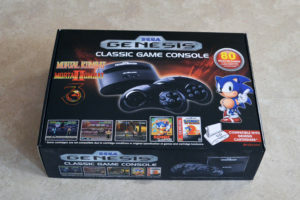 The composite connection is just about the poorest connection available, but also the most universally compatible, especially with the type of older CRT TVs the Sega Genesis games were originally intended for. It’s best to use this console with one of those older TVs as video quality will vary dramatically on modern displays, although is still usable, even if some of the menu text and other text-based items aren’t as clear as they could be. Naturally, when using this console on a modern display, you’ll want to make sure the games display in their original 4:3 format rather than 16:9 (widescreen), although that’s more of a pet peeve of mine than a strict requirement. This is expected to be the final release of the Classic Game Console before AtGames moves to a new hardware architecture, so there is an extra layer of collectibility to this year’s iteration on top of the 25th anniversary element. On a related note, since this is also expected to be the last such version to work with legacy composite AV connections, if this is the type of product you like to use with a CRT television for additional authenticity, this is definitely the version to get. In terms of value, it’s rather high, even if you discount the 41 “other” games from the 80 total, working out to less than $1 per original title at retail. Save support for the three included RPGs is also welcome. UPDATE: Thanks to “onmode-ky” for pointing out the game split is now 41/39 rather than the usual 40/40. I edited this review accordingly.